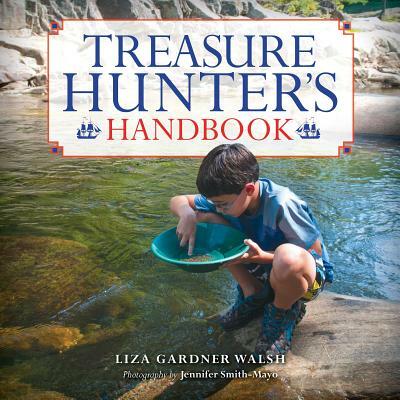 Treasure Hunter's Handbook is for kids and families who love to explore the world around them Treasure hunting is a fun family activity that encourages kids to get outside, and Gardner Walsh's new book helps young explorers learn how to pan for gold, use metal detectors to find buried treasure, use GPS to do geocaching or letterboxing, and search for arrowheads and gemstones. Treasure Hunter's Handbook also includes wonderful bits of pirate lore and some fun pirate/treasure-hunting craft activities. Ahoy, matey The following topics are covered, allowing for a wide range of activities for different ages and interests: Myths and legends of buried pirate treasure. Panning for gold: Panning for gold is making a comeback and is a great activity for kids. Mining for minerals and gemstones: Provides some information about how and where to find Maine's famous tourmaline and other gems. Metal Detecting: Covers the basics of using a metal detector and tells some of the stories of amazing treasure found using this simple device. Geocaching and letter boxing: Geocaching is a real-world, outdoor treasure hunting activity using GPS-enabled devices. Letter boxing is a low tech version that combines navigational skills and rubber stamp artistry. Found treasures: Hunting for everyday treasures such as sea glass, sea shells, four-leaf clovers, arrowheads, and fossils.